I thought we had gotten over people trekking from Lagos to Abuja for PMB, or trekking from Abuja to Yenagoa for GEJ. After the first young man trekked, the rest abused it, that people began to get tired of it. After the elections, the trekking died with it, phewww, what a relief, I thought. I was tired of seeing the headlines of the trekkers. Now shortly after the swearing in ceremony of the new Governor of Kogi State, trekking has somehow resumed again, to commerate the victory of the new Governor. Do not get me wrong, i felicitate with the new Governor and i pray he is the change agent we need. What caught my attention Was the fact that this time it was a masquerade trekking to Abuja from Kogi State, or from Abuja to Kogi. That took me down memory lane. Growing up at Idah, Kogi state. We saw lots of various kinds of masquerades, especially during festivities. The masquerades made Christmas, Sallah celebrations much fun. If a parent denies a child that outing, it will feel like the world has crumbled. It was very important to children to go out and get chased by these masquerades. Even though it was fun and a sight to behold we were still very afraid of them. During festivities when our parents let us go out like a lot of other parents do, all you hear is screams from other children or you see them running in all directions from various masquerades. There are very many types, I remember some of their names, 'OLOKOPIO was one of them, There was one called UCHORO DUDU,(means; the pot of black soup), its face was really very black. It has it's real name but i cannot remember it, but if you want to get chased, you call it by this name and you will get the chase of your life. My Parents lived about ten minutes away from the Ega market, there was a day my sister and i were taking a short route to the market, while this masquerade was on the main road, and we were screaming UCHORO DUDU, UCHORO DUDU! It left the main road and was headed towards us, My God! when we saw it coming we ran with all our might while screaming at the top of our lungs. There was no house close by, only trees so we ran into the market towards the statue of INIKPI, as children who believed anything, we were told masquerades were not allowed to see the statue, so we ran there for safety . The masquerade did turn back, even before we ran into the market, but because were afraid we did not even notice. 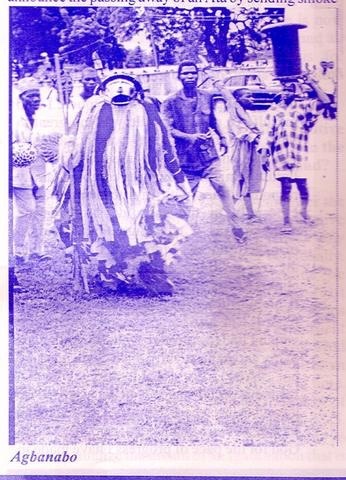 There was AGBANABO, EGWU-AKPOKO, (means Chilli/pepper masquerade), AJADU- APIEPIE, OLAGENYI (from Audu Ewo's compund. EGWU-GBOMGBOM, (can look as flat as a plate on the ground and then spring up taller than a tree). 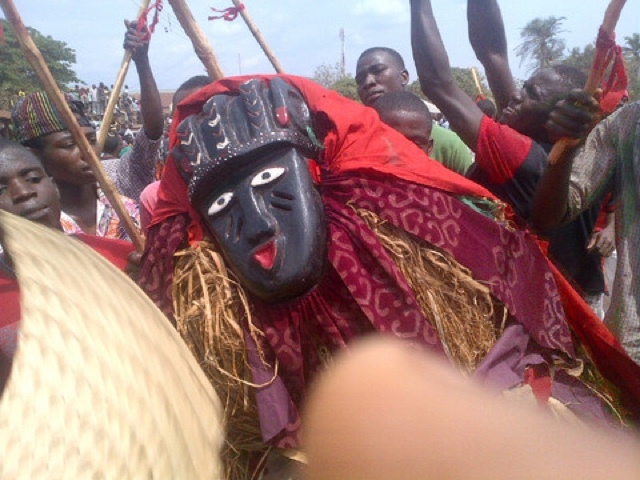 EGWU-ANYANYI ( the laughing or smiling masquerade). She had a smiling face and was not violent. I remember one brand of masquerade called 'AGANA'. They were quite violent, there are different types of that brand of masquerade. The person who controls it holds a long leash tied to its waist, they never let it move around unsupervised or without a leash. And they have speed, when you call out to them and they begin to chase you, you had better run to the nearest house to hide. I remember one particular Christmas, we were at a part of Idah called Sabongari, and AGANA began it's usual chase and we were running and screaming, unfortunately it wasn't an area we lived in, so we ran to a compound we saw almost everyone run to, adults and children alike ran. When we thought we were safe and were catching our breath, AGANA somersaulted into the compound, we were all confused, filled with fear and many fell and we were all trying to find our way out of that compound. 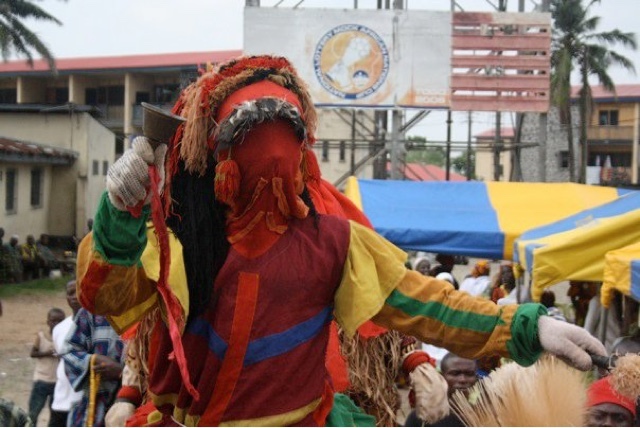 We were told growing up that most of those masquerades were spirits, while some were not. After Idah, we lived in Koton Karfe for a while, they also have masquerades but they don't look as scary as the Igala masquerades. Sometimes they do come out even if it wasn't a festive period. There was a time my sister and I were visiting friends and we sat in front of their house deep in teenage conversation. Suddenly a masquerade appeared right in front of us, we did not see it coming, we ran in various directions, some of us to the bedroom and others to the bathroom. This masquerade began calling out our names, Rosemary come out, Roselyn come out, Florence come out, Ladi come out, then we knew that whoever was in the masquerade costume knew us very well and it wasn't a spirit. That did not stop the fear, but we still refused to come out. We only came out when we were they were gone. I wonder if I ever overcame my fear for masquerades and perhaps might still run for my life when I come face to face with one of them. I did enjoy a lot of Christmases as a child because of those masquerades. I would like to hear of other people's experiences. Hehehehehe, They do look scary, and what a nice experience.